We love subtle details like this Mickey Mouse Icon tastefully inserted into the wedding bouquet. Sometime back in November of 2016 I received a call from a mother of a groom-to-be. Her son & fiancé were to wed on June 20 the following year – a Tuesday. They had just booked Cranzdorf Lodge, a cabin that sleeps over 50 people – HUGE! The folks who showed them the cabin referred us. We had done a bridal session there earlier in the year. I tell you this because we love word of mouth referrals. And we love Cranzdorf, and we love folks who travel to the Smokies to get married and we love folks who do things their own way. And getting married on a Tuesday qualifies as unique. 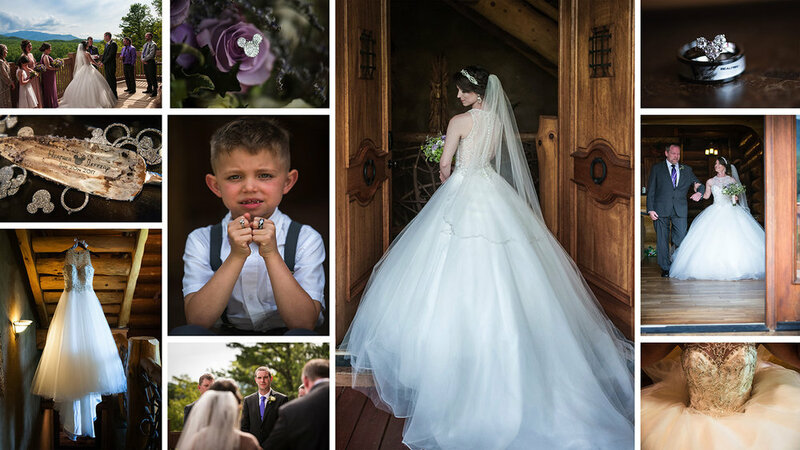 This is a few of the highlight images of "Disney in the Smokies: A Fairy Tale Wedding"
So that’s the backstory. Now for the set up. I spoke with the bride to sort out the details of the contract, timeline, etc. These things evolve, but Heather was already very squared away. This is another indicator of tremendous wedding. We learned they were from Wisconsin and they loved the Smokies. We also learned that Heather has the heart of a real Disney performer. She also mentioned there’d be some sublte Disney details. We love subtle details too! Before I go any further, I’d like to list all the important people and businesses that helped make this wedding wonderful. Earrings: Maria Elena (won at a bridal show) FREEBIE!!! Invitations - hand made by Family BONUS!!! The wedding day started at About You Salon. All the folks working there were happy, fun and really great at making the ladies beautiful. We love walking into a salon with a great vibe and happy people. Heather would be last in order so she’d be the freshest. She started with her make up & finished with hair. We really love the “getting ready” moments because of the lighthearted and playful atmosphere. The girls at All About You Salon were amazing! After the hair and makeup is done, Heather has a refelctive moment. We left the salon and headed toward Cranzdorf one of the largest and most luxurious cabins in the Smokies. It is a beast of cabin above a golf course with killer views of the Great Smoky Mountains National Park. Cranzdorf Lodge as seen from a distance. The guys were downstairs getting ready. They were ready in just a few minutes so we captured the groom with his groomsmen. Jeffery and his groomsmen - studs! The girls were on the main floor getting into their dresses. And the dress was just breathtaking! We cannot say enough about this dress. It was perfect for Heather. Keep reading and you’ll see just how amazing she looks. Once all the ladies were dolled up, we photographed the bride and bridesmaids. Every once in a while we find a ring bearer that is spunky and super fun. This kid wins the title. He was such a charmer. Cutest ring bearer ever!! Look closely at the wedding ring - sublte Mickey Mouse Icon again. Heather & Jeffery made some really solid choices regarding their photography. First, they opted to take the family and formal photos BEFORE the ceremony. Second, they chose the have a First Look before the family photos. In our experience this is best because it gives the couple time for each other first. And by getting the family and formal photos finished before the ceremony it means right after the ceremony the celebration can begin. We chose a quiet little opening along side a very private road (about 5 minutes from the cabin) for their first look. We put a blindfold on Jeffery to keep Heather hidden. His Best Man busted out a cigarette for a comical “executioner” moment. We love when couples are fun, creative and risk takers. Once they were in place Jeffery removed the blindfold, spun around and took in the beauty of Heather. We love First Look! Jeffery having fun with blindfold and cigarette. Wedding or firing squad? Too much fun!!! With blindfold there's no peeking! Jeffery was patient as Heather inched up behind him. That moment when he sees her for the first time! After a few minutes of quiet intimacy, we bring in the families and the rest of the bridal party for formal photos. This wedding was small. This part of the day went by quickly. The full bridal party - love the style and colors!! We headed back to the Cabin. Heather went and freshened up Jeffery relaxed and gathered himself. The ceremony would be on the main balcony. The guests, mostly family, found their seats. The bridal procession began. Their officiant was Jeffery’s cousin, Andy Sarow. The ceremony was filled with love, remembrance of those who couldn’t attend and very personal vows. Heather & Jeffery, along wtih their mothers to poured 4 colors of glass crystals into a vase. Each color had special meaning. They had the crystals made into a one of a kind sculpture. This idea is one more personal touch that we love. This moment is one we feel is a must have moment. Heather & Jeffery wave to a live streaming camera for grandparents back in Ohio who couldn't make the trip. The sky, mountains, perfect weather and it was pretty much a perfect day! Their mothers helped them fill a small jar with glass crystals. Family is always important. The glass crystals were made into this one of kind scuplture. No words needed . . . love wins! After the ceremony, the wedding recession began. The bridal party spilled into the main floor of the cabin. And we captured a few more family photos on the balcony. More family . . . cuz family! Mr & Mrs Miller decided to show off a bit with a few huge twirls! And we love brides that are confident and fun! Now insert a gorgeous backdrop like The Smokies and we can make magic! Heather loves the spotlight. And Jeffery loves showing off his new bride! After we capture a few images of the brand-spanking-newly married couple, we take the bride to a magical spot. The main entry to Cranzdorf has old world doors that gave us the strong, protective backdrop for a delicate and beautiful bride. And Heather owned her dress. She knew exactly how to move, flow, stop, smolder and leave everyone breathless. Love her smile. It says, "I know something you don't!" Although the 2 poses are similar, we used black & white to accentuate a timeless, classic elegance. This image is my favorite from this wedding. Magic. Pure magic! We took a break at this point and let the celebration become an un-photographed sit down feast. After the feast we whisked the couple to the top of an adjacent mountain for some final sunset images. We always recommend a few sunset photos. Once the sun went down we headed back to the cabin to cut the wedding cake. The cake was not only beautiful, but delicious too. And we think the smeared cake on the personalized cake cutter was the perfect ending to Disney in the Smokies: A wedding fairy tale. We love the elegant wedding cake with Mickey Mouse bling scattered about. I love how close Jeffery is watching her. The subtle details of Disney font and tasteful Mickey Mouse bling are what made this wedding amazing. Oh, and a great couple with great families and friends too!